Eating food contaminated with mercury may entail possible risks to human health because it is toxic to the nervous system. Mercury is a highly persistent environmental contaminant that is found especially in fish and shellfish. Other foods are not as worrying since the chemical forms of mercury that they contain carry a lower health risk. Methylmercury is the most worrisome form and may constitute up to 90% of the total mercury contained in fish and shellfish. These foods contain mercury because it is naturally present in the environment, as well as due to contamination. 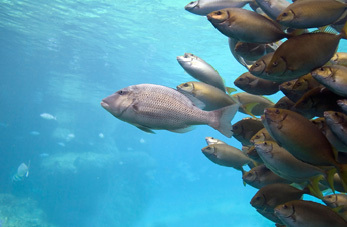 Large predatory fish contain the highest levels because they accumulate the mercury they eat throughout their lifetime. These species are frequently migratory which hampers the prohibition of fish from specific areas with potentially substantial contamination levels. European Union consumers who, in general, eat the average amount of fish are probably not exposed to dangerous levels of methylmercury. Consumers of larger amounts could be at a higher risk. Specific studies on the intake of groups considered to be at high risk are not available. This is why the European Commission recommends that certain vulnerable groups such as pregnant women, lactating mothers and small children restrict their intake of large predator fish. They should avoid eating more than a small portion (up to 100 grams) a week of swordfish, shark or northern pike. If they eat this amount, they should not eat any other fish during the same period. They should also avoid eating tuna fish more than twice a week. Swordfish is one of the most commonly eaten fish because of its culinary versatility. In many areas of Spain it is incorrectly called emperador, which is the name of another fish species that is less frequent. This may lead to error. Since fish is very important nutritionally, vulnerable groups should eat as many different species as possible and avoid eating the fish mentioned above which contain higher methylmercury levels. As to the rest of the population, what should they do? Outside of high-risk groups, it is recommended to eat fish at least twice a week, because it is one of the main sources for nutrients and an essential component of a healthy diet.